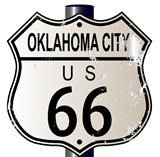 ELUNA 2016 will take place in Oklahoma City, Oklahoma. Your local hosts from University of Central Oklahoma, Oklahoma State University, and University of Oklahoma are eager to welcome you to the state most people know from a certain Rodgers and Hammerstein musical. We hope that you will enjoy your time in Oklahoma! Thank you to the Local Arrangement Team’s Local Info sub-committee for gathering this information: Anona Earls (UCO), Deborah Thompson (UCO), Starla Doescher (OU), Jaymie Turner (OU), Misty Long (OSU), and Michele Seikel (OSU). Oklahoma City is the capital and largest city of the state of Oklahoma as well as the county seat of Oklahoma County. Situated on famous Route 66, its neighborhoods are extremely varied, ranging from tidy affluent historic neighborhoods to districts in the midst of revival from the economic and social decline of the 1970s and 1980s. The city is home to several professional sports teams, including the Oklahoma City Thunder of the NBA, as well as 5 public Universities throughout the metro area. It ranks 29th among United States cities in population and is among the top five largest continental U.S. cities in geographic area, sprawling across 625 square miles of America’s heartland. 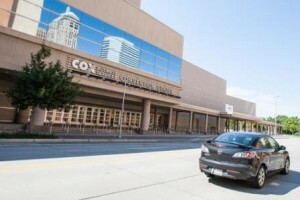 ELUNA 2016 will convene at the Cox Convention Center in downtown OKC. 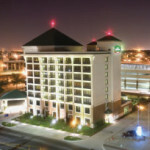 The convention center is conveniently located in between both of our conference hotels. Nestled in downtown and between nearby districts, our meeting place is located close to many hotels, restaurants, and attractions, including the Chesapeake Energy Arena, home of the Oklahoma City Thunder. Sheraton Oklahoma City Downtown: SOLD OUT. Changes to your reservation can be made by calling (405) 235-2780. Rated 3.5 of 5 (521 Reviews) & 51 of 147 Hotels on Trip Advisor. Located across from the main doors of the Cox Convention Center. Changes to your reservation can be made by calling 1-800-468-3571. 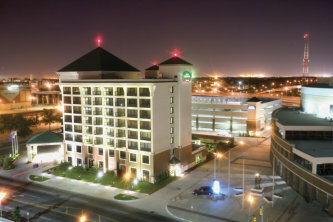 Renaissance is connected to the Cox Convention Center via skywalks, making it convenient to go to and from the hotel to ELUNA. Renaissance also offers amenities such as a spa, pool, and fitness center. ELUNA guests will also receive complimentary wifi. Have a car? It’s $12 for off-site parking (daily) or $25 for valet parking (daily). Changes to your reservation can be made by calling 1-888-236-2427. The Courtyard is located directly south of the Cox Convention Center, making it easily accessible for ELUNA attendees! Amenities include fitness center and pool. Guests can also enjoy complimentary wifi. For those with cars, it’s $14 for daily parking and $23 for valet parking (daily). Shuttle: Public and Private Vans are on site at the airport to meet all scheduled flights and transport incoming passengers. To arrange for pickup from home, business or hotel, reservations must be made prior to departure. MedRide MedRide provides wheelchair and special needs transportation. For rates and reservations call 405-685-8267. Update: Renaissance Hotel: The Renaissance hotel is no longer providing shuttle service. Taxi: There is a taxi stand outside baggage claim at Will Rogers Airport where you will find cabs waiting. Taxis are approximately $35 – 50, pending traffic. Rental: You can rent a vehicle from Alamo, Avis, Budget, Dollar, Enterprise, Hertz, National, or Thrifty at Will Rogers Airport. Arriving by car: Downtown OKC is located near where I-35 and I-40 intersect, so depending on your direction, you’ll be driving in from one of these major interstates. Here are the maps and transportation guides for Renaissance and Courtyard. If you are staying at one of our conference hotels, take note of the parking costs outlined above. 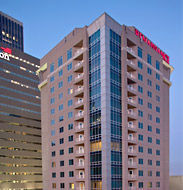 If you are a local guest, there are several parking garages in downtown OKC. Parking Garage B is the closest to Cox Convention Center. All garages cost $10 daily. Getting around town: Downtown OKC is definitely walkable for immediate surrounding attractions; however, for those feeling more adventurous but without a car, there’s other ways you can get around. Spokies: Spokies is Oklahoma City’s only bike share program, and the best way to cruise around downtown and through many of the city’s most exciting neighborhoods. There is a Spokies station immediately south of the Cox Convention center on W. Reno Ave.
Embark: Embark is OKC’s bus system. Check out their website to map routes. Taxis & Cab Services: Go to this Yelp listing of cab services available for use in the OKC metro area. Trolley: Embark offers a free trolley that routes through Downtown OKC. Click the link for a PDF of the trolley route and schedule. For an extensive list of dining options in the OKC Metro, please visit The Local Arrangements’ Guide to Eating Well in OKC, broken down by neighborhood starting from downtown. Enjoy! The American Banjo Museum houses the largest collection of banjos on public display in the world. Hours are Tuesday-Saturday 11am-6pm and Sunday Noon-5pm. Admission is $6 for adults. The National Cowboy & Western Heritage Museum preserves and interprets the evolving history and cultures of the American West for the education and enrichment of its diverse audiences of adults and children. Hours are 10am-5pm daily. Admission is $12.50 for adults. The Oklahoma City Museum of Art is an 110,000 square foot facility located in the heart of downtown and is an anchor for a growing cultural district of the greater metropolitan area. Hours are Tuesday-Saturday 10am-5pm, Thursday 10am-9pm, and Sunday Noon-5pm. Admission is $12 for adults. The Oklahoma City National Memorial & Museum consists of the Outdoor Symbolic Memorial and the Memorial Museum both of which honors those who were killed, those who survived and those changed forever on April 19, 1995, the date of the Alfred P. Murrah Federal Building bombing. Hours are Monday-Saturday 9am-6pm and Sunday Noon-6pm. Admission is $15 for adults. The Myriad Botanical Gardens is one of Oklahoma City’s most beloved public spaces, offering its visitors a 15 acre natural escape in the very heart of the metro known as downtown Oklahoma City. Hours are 6am-11pm daily for the Myriad Botanical Gardens Outdoor Grounds and Monday-Saturday 9am-5pm and Sunday 11am-5pm for the Crystal Bridge Tropical Conservatory. Admission for the Outdoor Grounds is FREE and $8 for the Crystal Bridge Tropical Conservatory. Oklahoma City Zoo and Botanical Garden is a zoo and botanical garden located in Oklahoma City’s Adventure District in northeast Oklahoma City, Oklahoma. The zoo covers 119 acres and is home to more than 1,800 animals. Admission is $8 for adults. Martin Park Nature Center is a 140-acre nature park that combines recreation, education and wildlife. The Oklahoma City park features a hands-on nature center highlighting the animal life, flora and fauna of Oklahoma, picnic area, playground and a browsing library. Note that this is on the north side of town, so transportation would be needed. Underground A series of pedestrian tunnels that connect downtown buildings below ground. The tunnels contain exhibits on downtown history and local art. Note that the Underground can be used a tornado shelter, too. Bass Pro Shops has a store location in Bricktown that features over 100,000 square feet of floor space which includes an archery range, laser arcade, and 15,000 gallon aquarium. Brickopolis U is a three story restaurant with food, drinks, laser tag, arcade games, mini golf, and much more right in the heart of Bricktown Oklahoma! Bricktown Bike Bar is a 100% pedal powered vehicle that serves those looking for a different and unique experience. A tour on the Bricktown Bike Bar is a 16 person maximum group (10 pedalers, 6 loungers), that can be customized to pedal anywhere around Downtown Oklahoma City. One of their “party facilitators” will steer your group around town while you mix the perfect combo of beer and bicycles. Bricktown Water Taxi runs a continual service like a bus. All Water Taxi Ambassadors narrate points of interest along the way. A round trip takes about 40 minutes. During regular season you can board a Water Taxi every 10-15 minutes at their landing on the Bricktown Riverwalk. The OKC Dodgers are a Triple-A professional baseball team that plays at the Chickasaw Bricktown Ballpark. The 2016 schedule is not up yet, but there will most likely be at least one home game during your visit. The Ronald J. Norick Downtown Library is a beautiful four story library located in the Arts District of downtown Oklahoma City. Hours are Monday-Thursday 9am-9pm, Friday 9am-6pm, Saturday 9am-5pm, and Sunday 1pm-6pm. Admission is FREE…of course! For more information on local attractions in OKC, check out VisitOKC, Bricktown OKC, and TravelOK. What’s the difference between a tornado watch and a tornado warning? A tornado watch means that conditions are favorable for a tornado. You do not need to take shelter. A tornado warning, on the other hand, means that a tornado has been spotted and whomever is in its line of path needs to take shelter immediately. Pay attention to the location of the tornado. You may hear tornado sirens; however, take note that the sirens are sounded whenever there’s a tornado in Oklahoma County, i.e. the tornado could be miles away from downtown but still in the county! What should I do if a tornado warning is issued for downtown OKC? But do not let a fear of severe weather prevent you from attending ELUNA 2016! Knowledge is power, and the Local Arrangements wants to provide you this information for your own ease of mind. Stay alert, and you will be fine!